Truly, there isn't any way to tell you what a typical day looks like, as there are no typical days. And here's the real reason no two days are the same - travel! Even now, I'm writing this from my bed in Marbella. It's nearly 11pm and I'm finishing a day of touring an amazing resort and stuffing my face with Michelin Star level food. Sounds tough, right? Yeah, you'll never hear me complaining. I, quite frankly speaking, think I have the dream job I always wanted. But... and this comes with a big "but"... the dream job just so happens to come with little to no stability or routine, which is not good for someone who craves a pretty level life. Small price to pay, but you get what I'm throwing down here, right? Alright then, let's just say that we'll tackle what a pretty "average" day in London looks like for me, starting from the moment I roll out of bed. Shall we get the boring stuff out of the way? Like the fact that my boyfriend and I start our day with our best friend Nespresso? No, this isn't a plug, it's a genuine addiction. Coffee fuels this beast when I'm in London and I don't do much before it and having a Nespresso machine in the kitchen has been life changing for me, and devastating to my previous expenditure with Starbucks. We'll leave the obvious things like showering and getting dressed out of the round up, shall we? We all do that the same way. So, what's next? It's usually breakfast. Only I don't ever breakfast by myself when I'm in London. This is a time that's always occupied with a meeting. When I'm in town I take at least two meals a day with a PR from a fashion, travel or beauty company. As I'm breaking bread with these people so often, I can almost guarantee that one day at least half of my bridal party will be made up of these beauties. Would you kill me if I stopped there?... with PR meetings? It wouldn't actually be a lie to say that my day to day life in London is actually breakfast, lunch and afternoon coffee with people in the industry discussing creative endeavours. But, that wouldn't be terribly interesting would it? You know what? I think it's actually one of my favorite parts of what I do for a living. I have the opportunity to spend time with people who are as passionate about their work as I am, and together we get the chance to give birth to creative concepts conceived over pancakes with maple syrup in Notting Hill. Yeah, that's the only downside of all of these meals out - the enormous calorie count that comes along with them. Well, I feel like that in London, only I actively hunt for inspiration. If I'm meeting in East London, I'll look for new shops, street art or performing artists. Half of this content finds itself listed on my social networks, the other stays locked away inside this clunky old brain of mine for a rainy day or recollection. The important thing here is that I keep all my senses in play. I enjoy every moment I can and I take in as much as I'm capable of holding. Oh, and I write it all down! A ha! There is a constant. I am never without my journal. And within this journal there are thousands of notes, written as fast as the idea can be translated from mind to paper. Most will never see the light of day but I live in constant fear of forgetting a moment of creative clarity. And yes, there is another constant and this one is brand new. When I started FFG, I was working full time and writing until the small hours of the morning. I was getting three hours of sleep a night and knew it wasn't something that could last forever. Even when I took the blog full time, the hours didn't change. Everything I had went to the site and it left me drained and with very little in the way of real relationships. Basically everything else suffered but my little goose was going strong. I was happy. My new constant, however, provides an unparalleled happiness and unexpected strength. Every night at home is now mine. What I mean by this is that I have established a point where the blog day ends in London and my personal life begins. No laptops are opened, no twitter pages refreshed. Whether it's having dinner with my main squeeze or entering a vegetative state with Netflix, I claim this time at home as my own and it's made all the difference. I can't say the same for when I travel (as obviously I'm here working late again), but I can say wholeheartedly it's what happens when I'm home. So, in a nutshell, what's my day look like? It's just a mixture of meetings with people that fuel the commercial content you find here today and moments that inspire everything else. And squeezed in there you'll find me instagramming, blogging, snapchatting, tweeting and vloging about it all. How on earth I find enough content to satisfy each channel on a daily basis should be a full time job all in itself. Only, when you're "working" in an industry such as this one, every other turn is an opportunity to share something fabulous. Long may it continue! 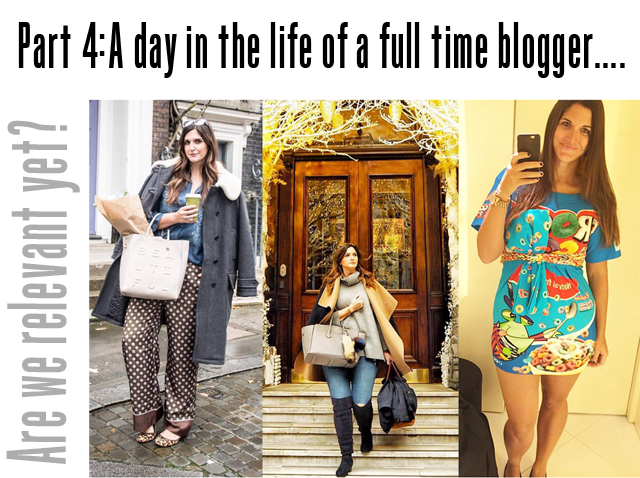 And here's hoping you have a clearer view of what life's like as a full time blogger. It's a never ending cycle of content creation and the moment that because stressful or strenuous is the moment I find gainful employment elsewhere. Start a blog... life is flipping fabulous! ** Brought to you by the council to create more fashion bloggers.**.... only joking. READ MORE: Head over to Mademoiselle Robot to read all about her schedule as a full time blogger.